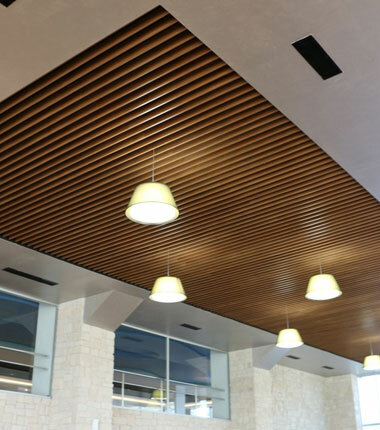 Envirotech is a leading Manufacturer of Wooden Acoustic Hanging Baffles, Wooden Ceiling Baffles. They can be hang suspended from the ceiling / truss as vertical baffles or horizontal. Wooden acoustic hanging baffles made out of solid Pine hardwood Slats of 14mm wide, 08mm thick at an 04mm interval. The baffles are fitted with Brackets and hanging accessories / suspension system. The width of baffle will be 50mm, depth 150mm and placed at 150mm C/C. Baffles are filled with acoustic insulation material of 64 Kg/m3 Rockwool Confirming to IS 8183, Glass Fiber Cloth Laminated , NRC Value – 0.90 NRC, the baffles will be in polish finish to match with existing interior. These hanging acoustic baffles help to control Echos on large covered areas.